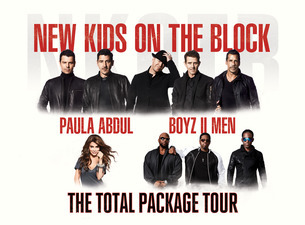 The Total Package Tour, currently touring the U.S., seems more like a New Kids on the Block show with a couple of opening acts. Boyz II Men opened the show at the American Airlines Center in Dallas, TX last night (May 23) with a nine song set that, chart wise, outshines the other two acts and just about any other they could perform with. Four of the songs went to number 1 with three setting records for longest stay in that position up to that time (and one still holding the record). Between End of the Road, I'll Make Love to You, On Bended Knee and One Sweet Day, Boyz II Men were at number 1 for a total of 49 weeks in the mid-1990's. Paula Abdul had the middle set, putting in a short, six song set that included five of her six number 1's (leaving out Promise of a New Day) along with the number 3 The Way that You Love Me. It was New Kids on the Block that received the bulk of the showtime, performing thirty-three songs including four of the five from their latest EP, Thankful. Included were all nine of their top ten hits from 1988 to 1990.